1. The contest runs from 1st December 2015 through to 31st March 2016, this is four months. It may be extended, but four months should be ample time to finish at least one MiniArt kit project. 2. The entry must be a MiniArt kit, appropriate for Track-Link. These include any armour or figure kit, soft skin vehicle, building or diorama base kit from any era. But ships and aircraft are excluded. 3. Any scale is good. MiniArt make 1/72, 1/35 and 1/16 scale kits. 4. The project must not be started before 1st December 2015 and finished on or before 31st March 2016. You may enter at any time during this period. 5. CATEGORIES. There are four categories…. • Diorama/vignette (NOTE; a MiniArt kit must be the main feature of the diorama…for example a MiniArt vac formed base/building with another manufacturers vehicle is acceptable as long as the main emphasis is on the base/building. Another manufacturer’s base is acceptable as long as the main emphasis is on a MiniArt kit and/or figures). • Best Blog; most regular, consistent and detailed build log. 6. You may enter as many times as you like. However; only one of your completed entries may be selected as a winner. 7. To enter, start a Build Log and keep it updated. Follow the guide to good Build Logs here: http://www.track-link.com/forums/news_general/45105. Be mindful of your spelling and grammar. * As an incentive to maintain a regular, consistent and detailed build log there is the additional prize mentioned above for the best formed build log. 8. When you have started your build log reply to THIS starting post with the URL of your build log, your name and the subject. This is very important in order ensure no valid entries are missed at the contest end. 9. The title of your build log must not refer to the contest. Neither should your introduction. Keep it simple for example ‘MiniArt Pz. Kpfw. III Ausf С’. 10. The project must be unique to this site. That is, it must not appear on any other web site or magazine. MiniArt will want to post the winners/entries in the gallery pages on their website; by entering the contest you agree to the sharing of finished photos with MiniArt for this purpose. 11. 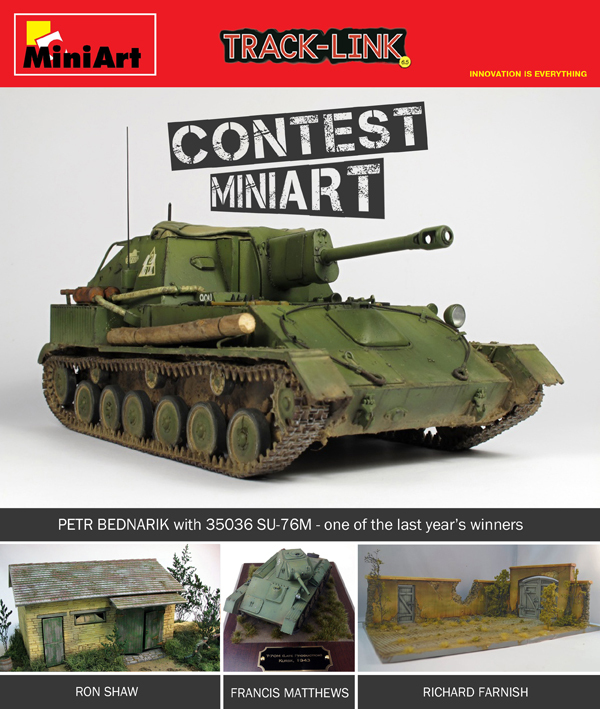 Judgement – MiniArt Models will be selecting the winners and awarding prizes to the three best projects. MiniArt’s decision is final. * Remember…there is an additional prize for the best formed build log with the most consistent and detailed updates. 12. Prizes – for the winner in each of the four categories the modeller shall receive a MiniArt kit of their choice.